Trash day changes in Berkshire Township. On October 22 the township trustees passed a resolution in support of House Bill 602 — “The Clean Water Fair Pricing Act.” We’re asking our residents to contact your state officials in support of this bill. Development and economic opportunities in rural townships hinge on sewer service availability. Recently, in spite of our repeated requests to be part of the discussion with the County regarding future sewer service for areas of Berkshire, an agreement was signed with the Village of Sunbury which, we believe, circumvents the best interest of some township landowners. The township had no input. In the agreement, the County has agreed to provide sewer to a certain section of Berkshire, while granting Sunbury the authority to provide sewer to other sections of the township. The issue is that existing non-village residents in the Sunbury-served area can be charged a higher rate for their service — with no limit as to what that rate can be — or they must annex into Sunbury in order to have sewer at the same cost as other village residents. If they sell their property and the new owner/developer needs sewer, they MUST annex to receive it. This practice is considered predatory and unfair by many legislators. Another fact — state tax dollars paid by all of us are used by the municipalities to build the sewer systems. They are then allowed to discriminate based on where you live to overcharge for the sewer service. HB 602 — The Clean Water Fair Pricing Act ” would prohibit any municipality in Ohio that accepts state funding for water and sewer system upgrades from overcharging any consumer based on where they live. It would prohibit what amounts to railroading landowners into annexation in order to be provided with basic sanitary service at a fair price. According to its sponsor, Representative Mike Duffey, this bill will stop these unfair practices. Below is a list of contact info for your local legislators. Please let your voice be heard. You may also Contact Jeff George at our office at 740-965-2992 with questions on this matter. New Play Ground Hill is Open! The culvert/hill in the kids’ play area is complete. Check it out next time you’re at the Township Hall. Special Thanks to Mike Dattilo, Jeff George, Dan Hale and Justin Williams for doing the hard work on this one! The Health District’s new satellite office in Sunbury will offer a variety of services, including birth and death certificates, plumbing licenses, clinic services and more! As we receive more information about this office we will let you know. It certainly will be a convenience to have these services available with an easy-to-park location for our residents. Stay tuned for more information about the opening date! We’ve mentioned that recycling is undergoing a change, but there is one thing in effect now that many people are unaware of. Plastic shopping bags from the grocery or other stores are a big no-no when it comes to recycling. If they are included in your recycling — you’ve gummed up the works — literally. We like to use them to bag recyclables in the house then and just throw them in the bin, but if you do that, everything in the bag is likely to end up in the garbage, NOT the recycle stream. Watch this short video to better understand why. 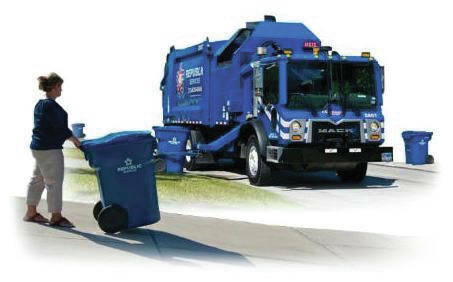 You should be receiving a postcard and/or robocall from Republic Waste in the next week advising you that the trash pickup day for the entire township will change from Friday to Thursday, effective Thursday, November 8th. This should help so if some pickups are missed they can be made on Friday instead of sitting over the weekend. The current contract for trash for the township expires early in 2019. The trustees are in the process of reviewing bid proposals. We will keep everyone informed as the process moves forward. Republic Services contact person for trash/recycling pick-up issues is Vic Citro, VCitro@RepublicServices.com 937-292-0602. Monday, November 12, VETERANS DAY, Township offices closed. Thursday, November 14, 7 p.m. Board of Zoning Appeals Meeting, if needed. Open to the public. Thursday, November 15, 7 Trustee Meeting, open to the public. Monday, November 26, 7 p.m. Trustee Meeting, open to the public. Thursday, December 6, 7 p.m. Zoning Meeting, open to the public. Monday, December 10, 7 p.m. Trustee Meeting, open to the public. Wednesday, December 19, 7 p.m. Board of Zoning Appeals Meeting, if needed. Open to the public. Tuesday, December 25, CHRISTMAS, Township Offices Closed. Thursday, December 27, 7 p.m. Trustee Meeting, open to the public. https://www.sunburynews.com/wp-content/uploads/sites/48/2018/11/web1_republic-services-performing-as-promised.jpgTrash day changes in Berkshire Township. Information for this story was provided by Berkshire Township.